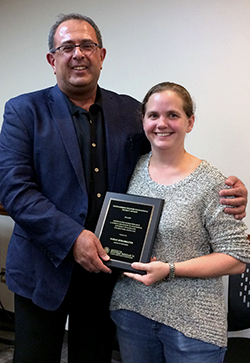 Associate Professor Sarah Bergbreiter (ME/ISR) is the 2017 winner of the ISR Outstanding Faculty Award. Bergbreiter is a gifted and talented researcher, a faculty member known for quality scholarship, a tremendous advisor and mentor, and a highly active member of the robotics and microsystems communities. At Maryland she has developed a strong and exceptionally high quality research program. She is especially known for interdisciplinary collaboration and contributions to the systems nature of research, as well as for her leadership, service and outreach. This summer Sarah completed a term as director of the Maryland Robotics Center. Her work is creative, professional and passioinate. She tackles interesting and difficult research challenges. Bergbreiter has 20 journal publications and 47 refereed conference papers in premier journals and conference proceedings in the fields of microsystems and robotics. It is notable that she has seven articles in the Journal of Micromechanics and Microengineering (two highlights and one cover photo) and an article each in Nano Letters, Advanced Material Technologies (front cover photo), and IEEE Robotics and Automation Letters. Bergbreiter has given 54 invited talks, including plenary and keynote presentations, well above the typical number for an associate professor. She has received the 2008 DARPA Young Faculty Award, 2010 IEEE International Conference on Robotics and Automation Best Conference Paper Award, 2011 NSF CAREER Award, and the 2013 PECASE Award. Her miniature robotics work has also received considerable attention in the press, including IEEE Spectrum, MIT Technology Review, and Popular Science. Bergbreiter was also included in the list of “25 women in robotics you need to know about” by the robotics online platform Robohub. She has been featured in a video for NSF and has also given a TED Talk.